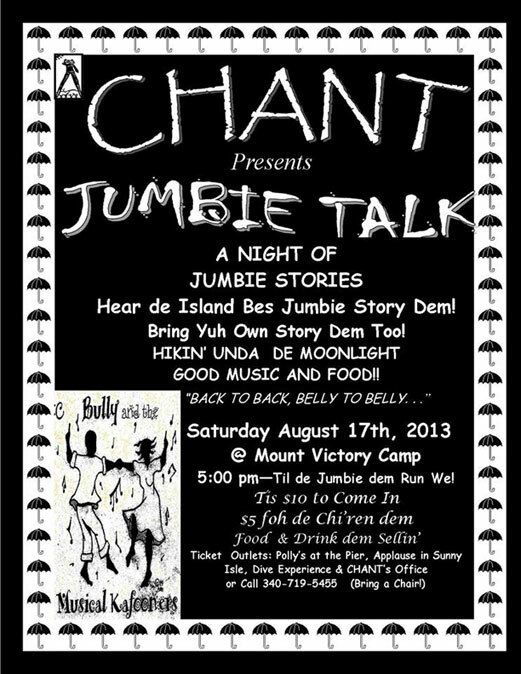 CHANT Presents: A NIGHT OF JUMBIE STORIES - Hear the Island's Best Jumbie Stories! CHANT: Crucian Heritage and Nature Tourism. Nature Tours and Activities, Cultural Art and Crafts, Heritage Performers, Historical Architecture and Tours. Hear the Island's Best Jumbie Stories! or from CHANT's Office prior to the event. PLEASE HAVE YOUR RECEIPT WITH YOU! Please make your selections on the form below and click the "Buy Ticket" button. To add additional tickets (i.e. Children's tickets) to this purchase, click the "Continue Shopping" button from your shopping cart to return to this page, choose "Children" from the dropdown, and click the "Buy Ticket" button to add the tickets to your cart.